Michigan State quarterback Brian Lewerke was 18-of-28 for 212 yards and two touchdowns. EAST LANSING, Mich. (AP) — Joe Bachie wasn’t sure if it was an interception or a fumble recovery. “I just knew I’d caught it,” the Michigan State linebacker said. Bachie came diving in and gathered the ball out of midair, giving the Spartans a crucial turnover in the third quarter of their 17-10 win over Iowa on Saturday. That play — it went down officially as a fumble — ended the most promising drive of the second half for the Hawkeyes, and Michigan State held on to win. Brian Lewerke threw two touchdown passes to Felton Davis in the first quarter, and the Spartans (3-1, 1-0 Big Ten) forced two crucial turnovers in the third. Iowa (3-2, 0-2) managed only 19 yards rushing and has now lost its first two conference games for the first time since 2008. Davis surpassed his career high in receptions before halftime and finished with nine for 114 yards. His touchdown catches of 22 and 6 yards gave Michigan State a 14-0 lead, and that was enough for the Spartans to come away with an important home victory. Akrum Wadley scored for Iowa on a 9-yard run in the second quarter, but he was held to 30 yards on 17 carries. The Hawkeyes trailed 17-7 at halftime but were on the verge of scoring on the first drive of the third quarter. After a successful fake field goal, Iowa was inside the 10-yard line, but quarterback Nate Stanley had the ball slip out of his hand as he began a throwing motion, and Bachie caught it out of the air. Brandon Smith fumbled the ball away in Michigan State territory on Iowa’s next possession. The Spartans held on at the end after Lewerke scrambled for a first down on third-and-12 with under 4:00 to play. By the time Iowa got the ball again, the Hawkeyes were back at their own 16 with 45 seconds remaining. Iowa: The Hawkeyes lost to Penn State on the final play last weekend, but they were outgained badly in that game, and their inability to move the ball against Michigan State is cause for concern. The last time Iowa started 0-2 in Big Ten play, the Hawkeyes did rebound quickly, winning five of their final six conference games. Michigan State: The Spartans have already matched last season’s win total, and this victory gives them a solid chance to go to a bowl. They still have some issues offensively, though. The running game was substandard against Iowa and prevented Michigan State from putting the game out of reach earlier. Michigan State’s Jake Hartbarger put all five of his punts inside the 20, helping the Spartans hold Iowa at bay. The game may have turned on two plays near the end zone. Stanley lost his fumble in the third quarter. Back in the first, Michigan State’s Matt Sokol fumbled but was able to recover at the Iowa 6, immediately before Davis’ second touchdown. The Spartans had lost six fumbles through their first three games. Iowa: The Hawkeyes host Illinois next Saturday. 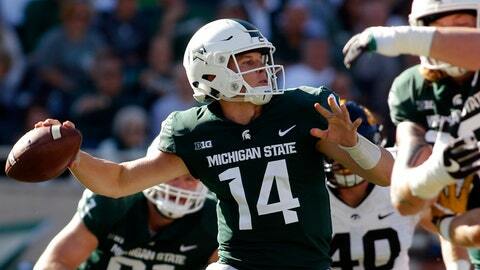 Michigan State: The Spartans head to Ann Arbor for a Saturday night game against rival Michigan. The Wolverines were idle this weekend.